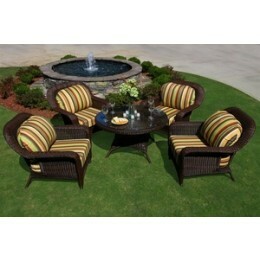 The Tortuga Sea Pines collection features all weather wicker, which is resistant to stains, cracks, water, splits, and UV. The chair frames are constructed of powder-coated aluminum with stainless steel hardware, they are lightweight and will not rust. Cushions are 100% spun polyester with optional Sunbrella brand premium performance outdoor fabrics and are resistant to mildew and color fade. Tables include heavy, 1/4" clear tempered glass. Every item in the Lexington collection is covered by a three year limited warranty. Java wicker finished items feature a diamond pattern on the backs: mojave and tortoise finished pieces do not feature a diamond pattern on the backs. Available in 6 different fabric choices. 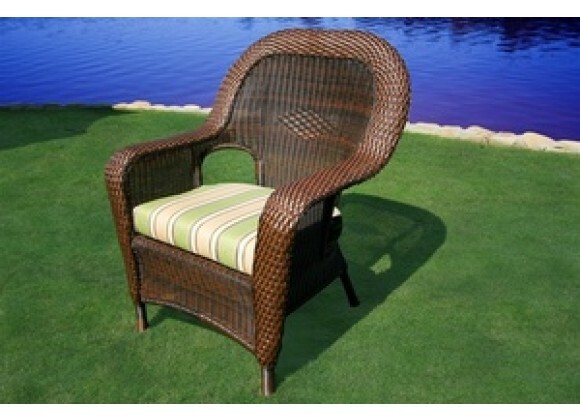 Outdoor all weather wicker - unlike natural wicker our all weather wicker is stain - water - uv - crack and split resistant. Mildew and fade resistant fabric.